ne of the strangest materials that pens have been made from is a material called Ivorine, a sort of protein based plastic that was developed in the late 1800's in an effort to replace the black board slates used in schools. The first white boards, in fact. According to David Wells, a pen collector that has done extensive research, Adolf Spitteler and W. Kirsch in Bavaria developed the process of making plastics from formaldehyde and... well... skimmed milk. In those days it was virtually impossible to add colour to the natural rubber that was mostly used in pen making, the only commonly colours available were black and red or a mix of the two referred to as mottled or rippled pens. 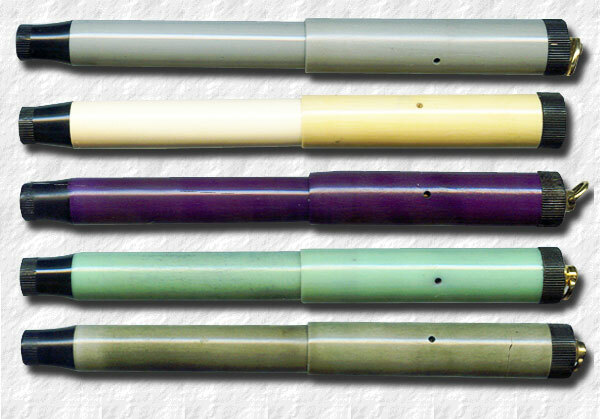 Although rare examples of other colours, for example rare Parker eyedroppers in black and green mottled rubber. These are however dull in the colours compared to later plastic pens. The new milk-plastic, casein, was patented in Germany in 1899 by the two gentlemen. Production began in Germany and France under the trade name of Galalithe and was featured at the Paris World Exhibition in 1900. First it was produced from milk curd, known as the "wet" process. Later Rennet (also used to make cheese) casein was precipitated from skimmed milk and dried into a fine powder that could be coloured and with chemicals added it could eventually be turned into sheets or rods. This process proved much more economical than using wet milk curd. In Russia a wet-curd version was called Syrolit, which was also manufactured in the UK, a subsequent dry process was called Erinoid. Other brand names were Lactaoid, Dorcasine, Aladdinite, Karolith, Kyloid and Galalith or Galalit. t could easily be dyed into almost any colour and was very popular when making small colourful objects, knitting needles, figurines and buttons. Especially the button industry preferred casein to conventional plastics, some into the 1980's, since it didn't melt under a hot iron, but production declined after the second World War when newer plastics were developed. As one would imagine casein wasn't really an optimal material for pen making. It was easily discoloured and was so susceptible to moist that if immersed in water it would swell by about 10 percent and rendered deformed upon drying. Fortunately the section of the pens were never made from casein but many pens were nevertheless destroyed during cleaning or by being stored in places with high humidity. Hence, strangely enough pens that have survived are either in very good condition or in very poor condition. If seldom used and stored properly, they kept in perfect condition. If not, they rapidly deteriorated. Another drawback was that the production process was slow. Since You couldn't mold casein very much it had to be hardened into a sheet or rod, when using the "wet" process. It took about a year to harden to a sheet of 25 millimeters. 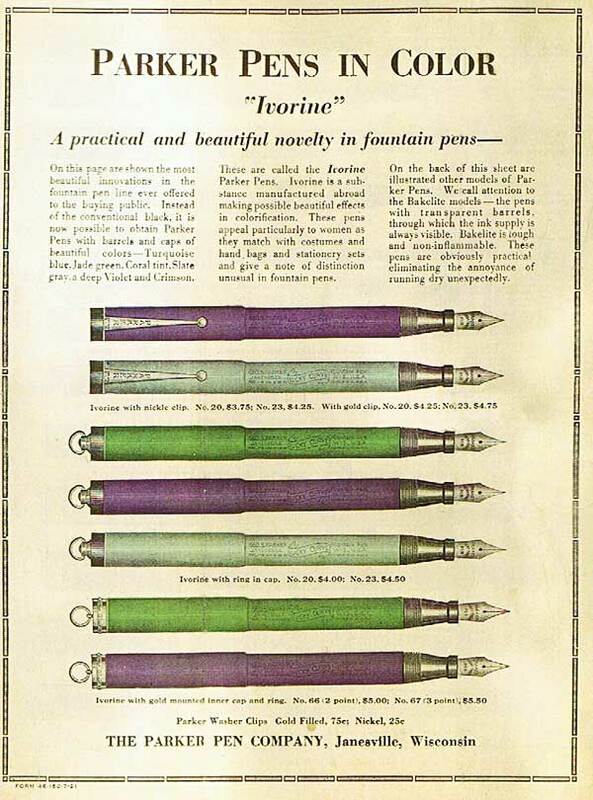 The first hint that Parker had been using casein was discovered in an 1906 ad for the Parker College pens. 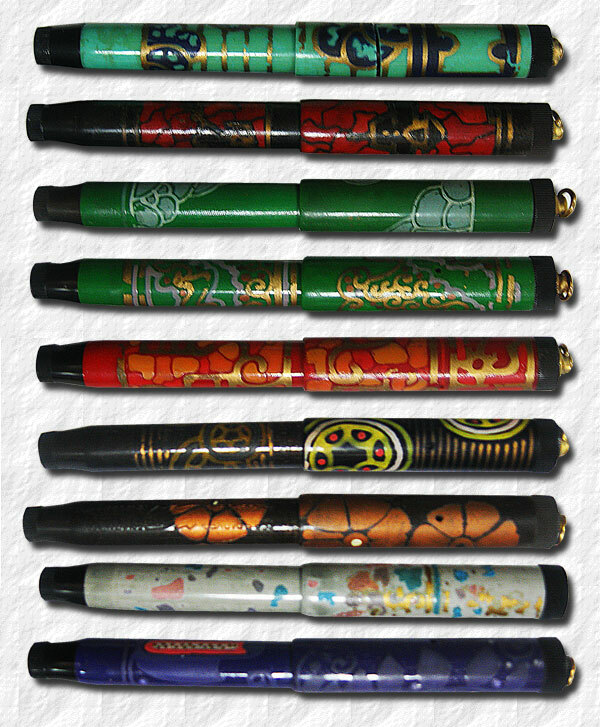 They were eydropper pens, made in black hard rubber but the cap tops were offered in different brilliant colours and offered to college fraternities and sororoties arguing that every member could have a pen in the same colours. Three fantastic Ivorines from around 1920.
uch later, in 1916, according to their own recapitulation, Parker introduced a small, colourful pen aimed at the ladies market. It was in all other aspects based on the Jack Knife button fillers offered at the time. It was called the Ivorine. It wasn't widely advertised, although Parker in one november 1921 ad boasted that it was selling like "wildfire", The truth was that Parker had trouble obtaining the raw material. Since casein wasn't readily available in the US it was being shipped all the way from France. A somewhat risky endevour since it was so sensitive to moist storing. The ad continues to explain that 1 200 pounds of the Ivorine pen material had arrived in New York on October 23rd 1921 on it's trip from Bordeaux. It was destined to be made into Parker "Safety sealed, self filling pens". It is possible that World War I hindered the export from Europe. David Nishimura refers to Parker ads in turn referring to the interruption of Ivorine availability due to the war. He believes that the source of the material prior to that interruption was Germany rather than France. Five wonderful Ivorines from the 1920's. It's quite possible that many of the mentioned colours were the same only with different names used in the advertising. hen the celluloid was invented the, casein in pen making was rapidly rendered obsoleted but some pen manufacturers, notably Conway Stewart, continued production. The Parker Ivorines were discontinued in 1925. They were replaced by the very similar celluloid (or as Parker refers to it Permanite) Pastels that were introduced in 1926. There has been much controversy regarding which pens are casein and which are not. Pen collector David Nishimura has handled many true casein pens and devised an easy test to see if the pen is really casein or "just ordinary" plastic. The only way to know for sure is to scrape a small amount of plastic from the inside of the pen and drip some acetone on it. Acetone will desolve celluloid but not casein (which also makes them difficult to repair). He argues that most pens in collector's hands believed to be casein are in fact celluloid, be that colourful ones. Hand painted Ivorines from the 1920's.